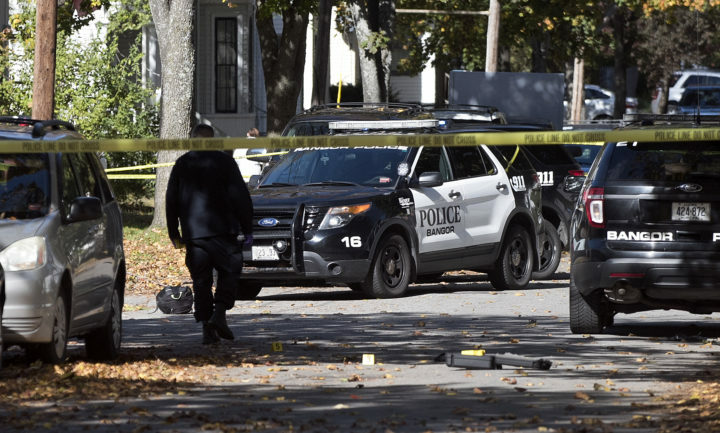 A man was hospitalized Tuesday morning after he was shot by Bangor police during an armed confrontation with three officers in the middle of Grove Street, according to authorities and witnesses. Officers headed to 112 Grove St. around 11:15 a.m. to respond to a domestic disturbance call at the apartment building, said Sgt. Wade Betters of the Bangor Police Department. When they arrived, a man holding a knife was walking away from the building, toward the intersection of Grove and Somerset streets, according to Todd Nadeau, who witnessed the shooting take place just yards from his home. Bangor Police Sgt. Wade Betters on the scene of an officer-involved-shooting at 112 Grove St. in Bangor Tuesday. Chief Mark Hathaway declined to describe in detail what occurred when the officers approached the armed man, but said on Tuesday evening that the confrontation ended when Officer Dylan Hall shot the man with his service weapon. Hathaway declined to disclose what weapon the man had in his possession. The man was hospitalized and is expected to survive his injuries. Hall has been placed on paid administrative leave, which is standard procedure when a Maine law enforcement officer fires his or her weapon in the line of duty. Nadeau, a retired Maine police officer who lives on Grove Street, watched the entire confrontation unfold from about 20 yards away in his driveway. He was in his garage when he heard shouting, he told the BDN in an interview late Tuesday night. 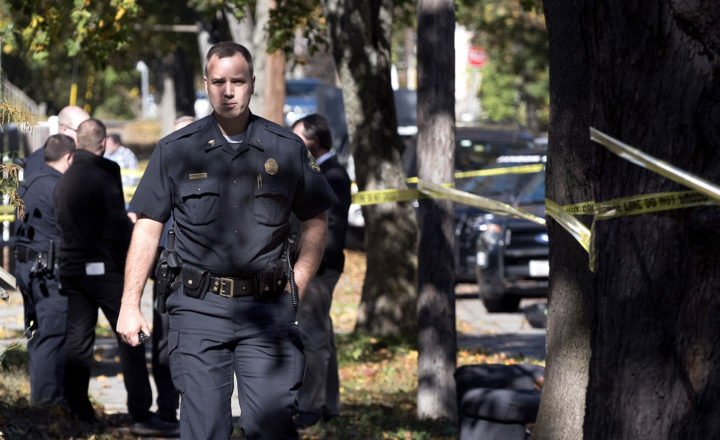 Nadeau said when he walked toward the street, he saw two Bangor police cruisers in the road and three officers with their guns drawn, forming a “semi-circle” around a dark-haired man holding a knife, “screaming at the top of his lungs” and hopping back and forth, he said. Nadeau judged the man to be in his mid- to late 20s. Police gather evidence following an officer-involved-shooting at 112 Grove St. in Bangor Tuesday. The officers were about 30 feet from the man, who shouted “C’mon, do it. Do it. Let’s go,” over and over, interlaced with profanities, Nadeau said. In return, the officers repeatedly told the man to drop the knife. Eventually, the man lunged forward, “kind of like a body charge,” and the police fired “between four and six shots,” Nadeau said. The man collapsed, clutching the area below his waistline, crying out that he’d been shot, Nadeau said. Police placed the man in handcuffs while shouting for an ambulance, and paramedics arrived within minutes to place him on a stretcher, he continued. Nadeau estimated less than a minute elapsed for the entire confrontation. None of the responding officers were injured, Betters said at a press conference about an hour after the incident. The victim in the suspected domestic dispute is safe, the sergeant said. 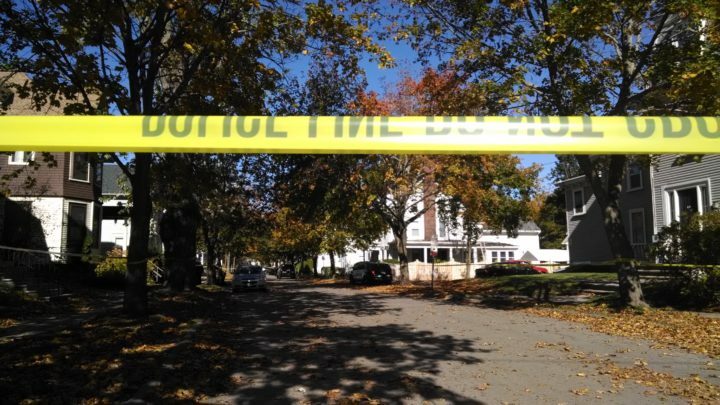 Crime scene tape cordons off an area of Grove Street. Police shut down a portion of Grove Street for the majority of Tuesday while detectives collected evidence and interviewed neighbors. At 5:30 p.m., the police chief held a press conference at the scene to identify the officer who fired his weapon as Hall, but released few other details. Prior to joining Bangor Police Department a year ago, Hall worked for Maine State Police, according to the Piscataquis Observer. He graduated from the Maine Criminal Justice Academy in 2016. A Bucksport High School graduate, Hall attended Eastern Maine Community College in Bangor and is a former employee of the Verso Paper Mill in Bucksport, the newspaper reported. Hathaway said the shooting, like all officer-involved shootings in the state, would be investigated by the Office of the Maine Attorney General. That office limits the amount of information departments may release to the public while it is investigating. A written report is released once the office completes its investigation. In its more than 100 reviews of officer-involved shootings since 1990, the attorney general’s office has never found that an officer should face criminal charges. Tuesday’s is the first officer-involved shooting in Bangor since Dec. 1, 2015, when Officer Ryan Jones fatally shot Joshua Jozefowicz, 23, after a traffic stop near Leadbetter’s at 1105 Hammond St.
A review by the Maine attorney general’s office found Jones was justified in using deadly force against Jozefowicz. 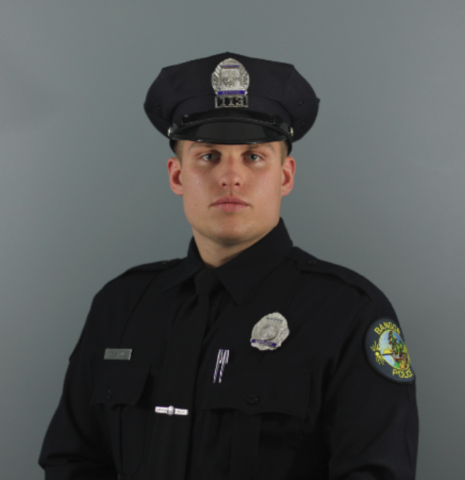 Correction: An earlier version of this story incorrectly stated that Officer Dylan Hall graduated from the Maine Criminal Justice Academy in 2017. Hall graduated in 2016.